Hello to all of My Creative Time Peeps!! Emma has a super fun blog hop going on today! We have 5 special guest designers and some fabulous prizes!! If you came from Micia's blog you are in the right place. 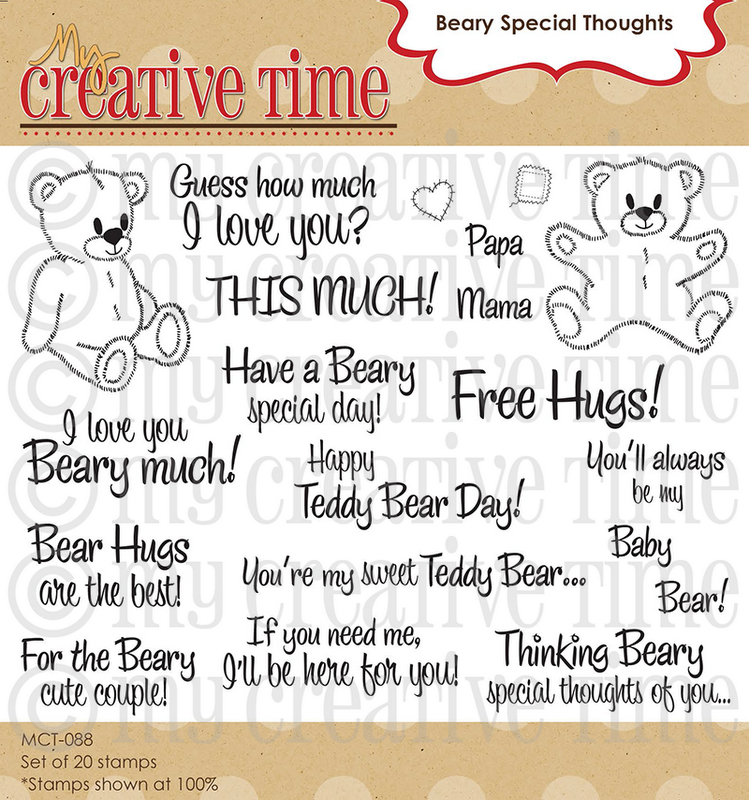 We are showcasing this fabulous stamp set called "Beary Special Thoughts" This set is perfect for any "beary" project! For my card, I used the Doodle Charm Cricut Cart. I love how soft it turned out. I cut the bear at 5.5 inches (yes, its a big card) and used chalk to color her in. How sweet does she look! I added some stitching and dollies to soften the colors. I finished her off with some eyelet lace. Ok and now here it is!!! HOW CUTE RIGHT? Make sure you stop by the design team's blogs and also our guest designers..This is a great way to get inspired!! Big crafty hugs and have a fabulous weekend! Love this card! Beary amazing! So sweet. Love your use of the lace. That skirt is just to cute!!! Aw that little skirt is adorable!!! Love this Nancy!! Very pretty, love the look of the chalk!! How pretty your card is, I love the little skirt on the bear!! Great job. How sweet! I like all the detail and embellishments on the card. Such a feminine bear design. So beautiful. Cute idea coloring with the chalks! Nancy ~ Oh my goodenss! I LOVE that you added the lace trim to your bear ~ reminds me of a tutu! Too CUTE!!! Well those flowers are GORGEOUS and so are the papers you used too! The sentiment is PERFECT for the card ~ such a GREAT card to give a really good friend~ BEAUTIFUL and CUTE all wrapped in one! What a cute card, love the lace skirt and the flowers. Super cute!!! Love your card!! Yes the sentiments are perfect!!! Miss Emma did a great Job and so did you with your project!! With the doily above her head it makes me think of a bride bear. How cute is that! Love the softness of the card and colors. Thanks for sharing. I really want this set of stamps. Very pretty card,love the lace addition. Very pretty and feminine card. The colors are so soft it made me think of those shabby chic vintage postcards. Thanks for sharing. The lace just makes this card perfectly girlie! I love it! such a pretty card love the green behind the bear :) tfs! What a sweet card! Love the soft color combo!!! Your card is adorable! 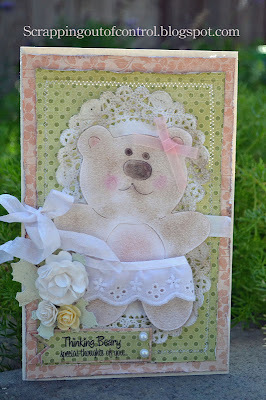 I love the softness you bear has to it and I love the colors you have used in the card. The lace is a fabulous added addition. Great card. i love all the embellishments! SO very pretty, love the flowers, they go with the bear so well!! The bear looks so cuddly! This card is so sweet! The chalking really gave it a delicate look that fits in perfectly with the design of the card. Love your card Nancy!!! Really nice for a bride. Thanks for sharing. I love this baby bear! She looks so soft. The flowers look great, too. She looks so soft and cuddly. Great card. Has a vintage feel to it for me. Must be the lace. Looks really pretty. Thanks for sharing. 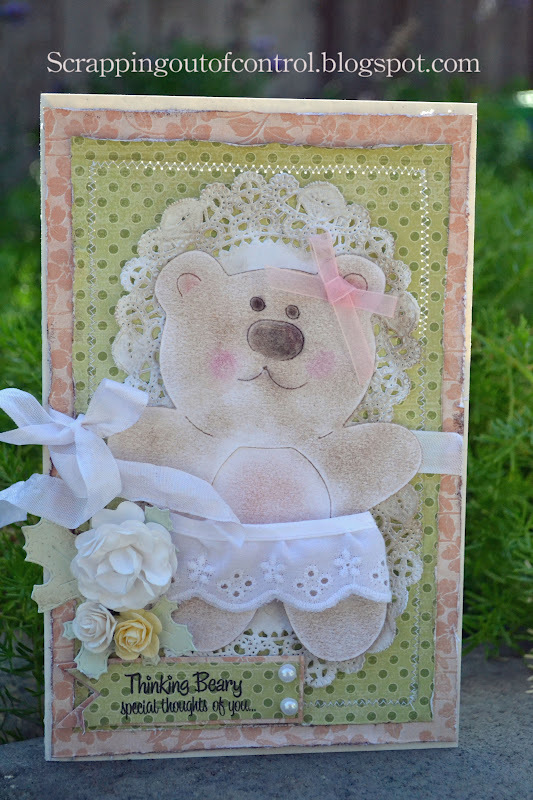 Super cute vintage card, I just love the look of the lace on it and the bear is amazing. The sentiment is perfect! Very cute! Love the eyelet skirt! So pretty. Love all the frills. So beautiful! I love the pearls...okay and the flowers...and the paper. FINE. I love it all! This is so beautiful!! love the colors and all your embellishments! Somehow you managed to make an adorable bear card look elegant too! Gorgeous!!! So cute! Love the embellishments you used and the soft colors. Cute card, very pretty. So soft looking. Thanks for sharing. What a sweet card! Love the lace accents! Super sweet card and love all the details. this card is amazing! I love the softness of all the colors and embellishments! Cute card, the bear looks like it's felt. Thanks for all you do. So cute - and the eyelet skirt was such a great touch! WOW!!! Amazing job with that chalk! It actually looks like velvet! So pretty! Any little girl (or grown woman hint hint!) would love to receive this! Very soft and pretty--I like all the embellishments. Nancy,this card is simply PRECIOUS!! I love all the extra embellishing you've put on it! :) TFS with us!!!! What a delicate teddy bear. What a cute teddy bear. Good job. Awww that is adorable card. Love the cute little bear. Just so sweet. Great job. Pretty card, love the soft look of the bear. Great use of the doily and the lace, just lovely! Liked the embellishments on the card. I always seem to run out of ideas! adorable. love the eyelet for the skirt. great card. Cute card and I love all the soft colors. such a sweet card. The lace is a wonderful baby touch. What a beautiful whimsical card. Love all the soft colors and lace! Wonderful to see our old cricut carts being used! 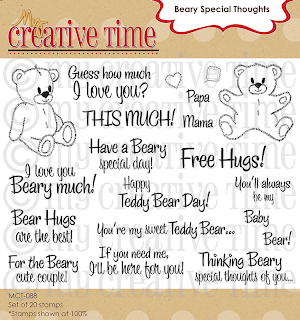 Your bear looks like fabric verses paper and ink,nice work.This new sentiment is perfect for your card. Love your bear and the colors are great. all of the little embellishments make it so soft and pretty. Very cute card, I love those stamps, thanks for sharing all the great ideas!!! Great job on your bear card! I love the soft chalk effect and her little skirt...too cute. Your teddy looks so cuddly!! Love that! 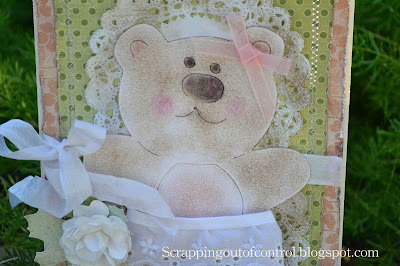 This card idea turned out "breay" cute and I love how you used the doily behind the bear! GREAT JOB! The soft touch is nice. Thanks for the chance to win. Wonderful card sorta vintage look I love it!! So cute! Love the new stamp set! Tfs! Darling card with such soft colors! OH OH OH ~ how cute is that little Bear! So girly and sweet ~ beautifully done! What a cute bear. TFS. Awwwwww... what a sweet bear! Your Baby Teddy Bear Card Is So Adorable!! Love the card. Thanks for share. what a sweet card. love the lace! I love your card, its soo cute. Super soft and sweet! The muted colors and the flowers are so lovely! TFS! nancy, your bear is perfect!!! I love all the pretties too! What comes to mind is SWEET. I love this card. Your teddy bear looks soft enough to cuddle!! So cute! I just came by from Micia’s blog hop; aww your card Nancy is super cute I just love it. Wow! What a gorgeous card! I love the little doily, I think I may need to go on a shopping trip! Great job my friend! How pretty!!! Love the lace and the beautiful flowers! !